Srinagar, Aug 30 (KNS): A complete shutdown called by Joint Resistance Leadership (JRL) comprising of Syed Ali Geelani, Mirwaiz Umar Farooq and Muhammad Yasin Malik on the eve of hearing of a petition against Article 35-A in the Supreme Court Thursday crippled normal life across the Valley. According to Kashmir News Service (KNS), all shops, business establishments and educational institutions are closed and traffic is off the roads. In wake of the shutdown, the law enforcing authorities imposed restrictions in Srinagar areas falling under the jurisdiction of seven police stations. The officials said that strict restrictions were imposed in Nowhatta, Safa Kadal, Rainawari, Khanyar and Maharaj Gunj Police Stations while as the partial restrictions were imposed in Maisuma and Kral Khud police stations. Witnesses told Kashmir News Service (KNS) that the forces deployed in restriction bound areas had erected the temporary barricades on the roads, thus halting the vehicular as well as the pedestrian movement. They said that at several places, the forces were seen frisking the commuters. Besides, Hurriyat Conference (G) chairman, Syed Ali Geelani, and Hurriyat Conference (M) chairman, Mirwaiz Umar Farooq have been house detained in an attempt to prevent protests while as Jammu and Kashmir Liberation Front (JKLF) chairman, Muhammad Yasin Malik as per the JRL statement has gone into hiding to lead a protest on August 31 over abrogation of Article 35-A. Meanwhile, the protests against the abrogation of Article 35-A was held at Srinagar, Langate, Tangdar and other places here during which the protesters demanded dismissal of the petitions seeking scrapping of Article 35-A. In Srinagar, Industrialists Association of Khonmoh (IAK) carried out a protest march in support of Article 35-A. 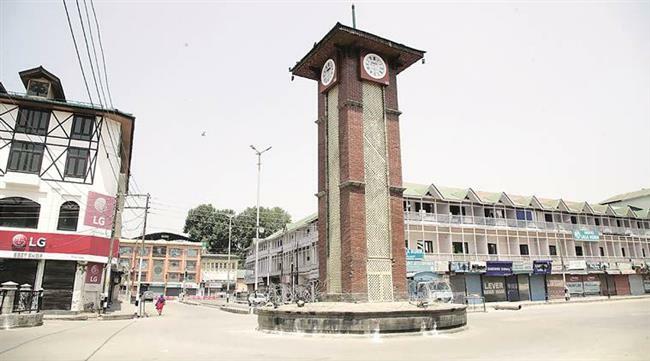 The protesters assembled at press colony here and later marched towards clock tower (Ganta Ghar) to express their resentment over the attempts to scrap the State subject law. The IAK members said that they won’t allow anyone to fiddle with the Article 35-A. In Batagund Langate, the traders took out a protest march against tinkering with Article 35-A. Amid shutdown observed on JRL’s call, the traders at Batagund Langate holding placards showing slogans on Article 35-A took out a protest march. They demanded that the Supreme Court must dismiss the petitions seeking abrogation of the law. According to the KNS correspondent, the residents of Tangdar-Karnah also hit the streets in support of the protection of Article 35-A. Chanting slogans and holding banners, the residents vowed to fight for the safeguarding of the constitution at any cost, saying that any tinkering with the law will be against the aspirations of people. It is worth to mention here that a complete shutdown was also observed in Rajouri district in Jammu division on the call given by All Party Coordination Committee (APCC) Rajouri. Reports said that all the shops and business establishments remained closed across the district. The APCC has also called for protests on Tehsil levels in support of Article 35-A on Friday, saying that any tinkering with the law will have serious consequences. In Chenab Valley, all the areas including Doda, Bhaderwah, Banihal, Thathri, Gandwah and Kishtwar also observed complete shutdown today in support of State Subject law. Amid the shutdown, peaceful protests were organized by various religious and other committees in the areas during which the protesters raised pro-Article 35-A slogans. Moreover, the railway authorities also suspended the train services from Baramulla-Banihal as ‘a precautionary measure’. It may be recalled here that Joint Resistance Leadership comprising of Syed Ali Geelani, Mirwaiz Umar Farooq and Muhammad Yasin Malik have called for a two-day shutdown on the eve of hearing against petitions filed for abrogation of Article 35-A in the Supreme Court.